Did you know that a couple celebrating any wedding anniversary on or after their 50th is entitled to a greeting from the president? Hot dog! This is one of those Wikipedia facts I came across while searching for the list of traditional anniversary gifts by year (first year paper, second year cotton, etc). I'd forgotten that there are now two categories to choose from—a modern list, which calls for glass or crystal for the third year, and the traditional list, which says it’s leather. The question of which category to follow quickly led to: What kind of a leather or crystal gift would Matt even want? Which led to exactly zero ideas, which led to thinking that it would be more fun if instead of a list of these broad materials like crystal and wood and silver, the list was instead made up of different landmark meals. The first anniversary (as they say it’s the hardest) could be something classically celebratory like steak. And for the second, how about something a bit more run-of–the-mill but still special, like a whole roasted chicken? And for the third—how about lasagna? To be honest, I had had a particular lasagna in mind for a while now, one from Jerry Traunfeld's The Herbal Kitchen. Instead of meat, there's tons of basil and béchamel. And the greatest thing about lasagna? You can make it ahead of time, come home from work, put it in the oven, and have a delicious, special Friday night anniversary meal in no time. Of course, the prep doesn't exactly happen in no time. No, this lasagna will definitely take a couple of hours to put together. But here's what I would recommend: Free up a space on your kitchen counter and set your computer there. Dial up your best friend via video chat and begin the work of lasagna-ing. Tell your friend that there may be moments when you will be more concerned about burning your béchamel than conversing, and that at times, you will be in another room completely, but not to worry, you will be listening the whole time! Me: Well, I'm making dinner for Matt and then we'll probably watch back to back episodes of The West Wing. Friend: Oh, young wife stuff. And while watching ancient episodes of The West Wing—we started at season one a month ago—may not fall under the young-wife category, I can completely trace my cooking beginnings to getting married three years ago. In fact, the more I think about it, the more I can directly correlate marriage to the start of this blog. Because when I first began to cook, I was so enamored of the results of following a few simple steps that I would take pictures of the dishes before we ate. I still remember the menu for the birthday meal I made Matt just eight days after the wedding: pork chops, asparagus, and peaches sautéed in butter with freshly whipped cream for dessert. I'd never purchased pork chops let alone any raw meat that required being wrapped in butcher paper, and so I remember reading the description exactly as it was written in the recipe to the man behind the counter: "Yes, I'd like two bone-in center-cut pork chops, please." It was a novelty and I felt supremely adult and truly domestic. This was also in the days before I had acquired my mom's old electric mixer, and I distinctly remember Matt and I passing the heavy cream between one another taking turns to whip it, cheering the other one on as if it were a high school sports event: "C'mon, Matt! You got this! I know you've got this!" I look back at those photos and think: We were so young! And yet, it’s only been three years. I can't imagine what I'll think at our ten year. Although there is one photo that feels very much like us and I think it always will. 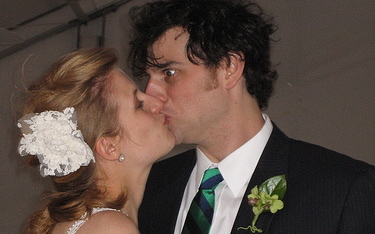 Is that fear in Matt's eyes or the shock of marital bliss? What do you say, Matt? If the next 47 years are anything like our first three, I think we’ll be a shoo-in for that presidential greeting, don’t you? Boil the tomatoes in a large skillet over medium-high heat, stirring occasionally, for about 10 minutes, or until they turn into a thick sauce. Stir in the marjoram and 1 teaspoon salt. Melt the butter in a large saucepan over medium heat. Whisk in the flour and cook the roux for about a minute. Pour in the cold milk all at once. Whisk until all the lumps disappear, then occasionally until the sauce comes to a full boil and thickens. Season with 1 ½ teaspoons salt. Blend the ricotta with one-third of the white sauce in a food processor until smooth. Scrape the cheese out into a bowl. Without washing the food processor, pulse the basil, parsley, garlic, and ½ teaspoon salt until finely chopped. Add the remaining white sauce and the Parmesan and process until well combined. If it’s your first time dealing with oven-ready noodles the process will seem strange, but just trust it. Spread half of the tomato sauce in the bottom of a 9x13-inch baking dish. Arrange 3 noodles on top of the sauce; they should fit without touching each other or the sides of the pan. Dab half of the basil sauce over the noodles, covering the pasta as best you can. As you build the lasagna think about layering the ingredients in 3 stacks, spreading the filling just over the noodles rather than worrying about the gaps between and around the noodles, but if some spills over that’s fine. Top the basil sauce with 3 more noodles in the same position. For the next layer, distribute the entire amount of ricotta by scooping it in spoonfuls onto the top noodles and spreading it a bit, pressing down as little as possible. Top with 3 more noodles, then the remaining tomato sauce. Finally, put the last 3 noodles in place and spread the top with the remaining pesto sauce. Cover the dish with aluminum foil, tenting it a little so it doesn’t touch the lasagna, and bake for 30 minutes. Remove the foil and sprinkle the mozzarella evenly over the top. Bake an additional 30 to 35 minutes, or until the cheese is evenly browned. Let the lasagna rest for at least 15 minutes before you serve it; it will be very loose at first, but will firm up as it sits. The lasagna can be assembled ahead and kept refrigerated until you are ready to bake it (allow an extra 10 minutes in the oven under the foil), or baked ahead of time and reheated in a 350 degree oven. Best anniversary meal ever!!! 47 years until our presidential greeeeeting! ahahahha! that photo is my favorite photo of you two! ps: i like to comment early but it's hard to beat matt. aahhhhhhh, you made my eyes well up! stilllll welling up. ok, the tears are reabsorbing into my eye sockets now. i can type. you are amazing, matt is amazing, your wedding was DA BOMB, and that lasagna looks damn good too. cheers to the next 47 years for you and sweet matt. Can you and I get a prez greeting on our 50th? We only have 38 years to go! p.s. that was the best video chat EVER!!!! let's make it a normal. happy anniversary! this lasagna looks really good. like, i want to make it when i get home. sweet photo of you and matt! Happy annv! We just had our tenth last week. I love the West Wing. I watched it when it first aired but RBB didn't, so we watched them starting from the first season all the way through a year it so ago. How many does this feed? I would love to make it for my future in-laws who are all (sisters and brother-in-laws included) coming to stay for memorial day weekend...yikes!! Amelia, that is so funny! I love your story about being a "young wife" and I remember feeling that way, and a lot of it had to do with preparing dinners and cooking recipes out of Gourmet magazine. Thanks for giving us that delicious looking recipe for lasagna. I will be making it. Great photos. @Danielle: 10 years!! congrats, lady! Please make Mare make Matt's face in the end photo and photo-shop it into her videochat pic. If you like, or if she needs inspiration, you can have her looking at a record thrown into a wall. Ha, love that photo! This looks so scrumptious. oh my god! this is so cute! maybe barack will give you a special 3 year visit?? Happy Anniversary Matt and Amelia. And congratulations to Amelia for her very impressive SAVEUR award!! I think there are many more in your future. Also, I want that lasagna today! And Mare is right - your wedding was DA BOMB. The lasagna just looks so fresh and light - perfect for spring. Wow, what an amazing wedding photo. You should have used that on your thank you cards. The lasagna looks absolutely delicious. Thank you for sharing.